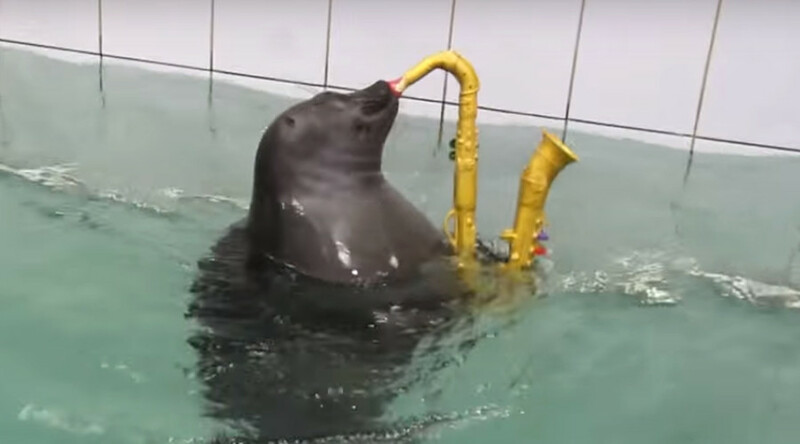 Wild seals originating from the Lake Baikal area in Siberia have turned out to be quite talented when it comes to dancing, drawing, and playing musical instruments. Baikal seals, previously not thought to be as friendly and obedient as related seal species, have recently proved scientists wrong, as two Baikal seals, Winnie-the-Pooh and Laska from the Baikal Seal Aquarium in Irkutsk, demonstrated an outstanding mastery of the fine arts. “As we found out, they are very capable and very intelligent animals. Probably, they are not inferior even to dolphins. They understand us well and so do we. So there is true collaboration in our aquarium,” Evgeny Baranov, Director of the Baikal seals aquarium, said. The aquarium in Irkutsk is expected to host 12 more seals that will undergo special training. They will practice their paint strokes and brass instrument playing techniques in preparation for a New Year’s show for children and adults. Apart from that, the seals will flex their muscles in a series of flips, rolls, and other tricks, which they perform in exchange for food. “We do not stop moving forward. Baikal seals amaze us again and again. Baikal seal was considered to be the most wild type of the seal before I started training them. We use unique methods that make them friendly and easy to communicate with,” Baranov, who also tutors the animals, added. Baikal seals, also known as nerpas, are among the smallest in the seal family. They are often dubbed the symbol of Baikal. Their main claim to fame is that they are the only fresh water seals in the world.